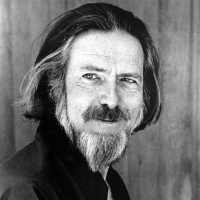 "Alan Wilson Watts was a British philosopher, writer, and speaker, best known as an interpreter and populariser of Eastern philosophy for a Western audience. Watts became an Episcopal priest in 1945, then left the ministry in 1950 and moved to California, where he joined the faculty of the American Academy of Asian Studies. Watts wrote more than 25 books and articles on subjects important to Eastern and Western religion, introducing the then-burgeoning youth culture to The Way of Zen (1957), one of the first bestselling books on Buddhism. In Psychotherapy East and West (1961), Watts proposed that Buddhism could be thought of as a form of psychotherapy and not a religion."